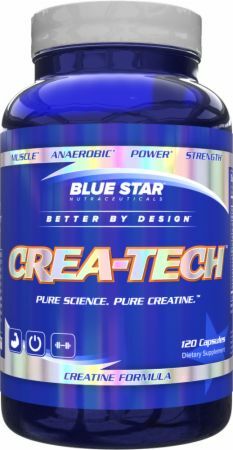 Blue Star Nutraceuticals Crea-Tech at Bodybuilding.com - Best Prices on Crea-Tech! When we decided to completely reinvent the world’s concept of creatine, our first step was to understand its users. It turns out you all want the same thing – to add muscle without fat. And so began our journey towards creating a creatine product that would do just that. And along the way, we started learning about more than just muscle-building. We began to realize that – in some cases – the best way to lead the pack, is to leave them far behind. Finally, German engineering comes to creatine. This is a VERY high quality creatine. But it's also more than just creatine. There is also an electrolyte blend and some additional ingredients that contribute to an overall experience a full tier above regular creatine. I definitely feel stronger when I'm taking this than just with regular creatine. And I love that capsules rather than mixing powder. Creatine in general can be hard to mix if you're taking it by itself, and always leaves residue that settles at the bottom of my glass. The fact that these are capsules makes them so much easier to take. I would wholeheartedly make the switch to these because creatine is something I supplement daily with, if it wasn't for the price. I simply could not justify spending $60/month for creatine, even if it is the BEST creatine I've yet tried. I'll keep my fingers crossed and hope that the price comes down or something like that to make this an easier decision. I had the opportunity to try out Crea-Tech recently. It is the first time I have tried creatine monohydrate in capsule form, and I was pleasantly surprised. 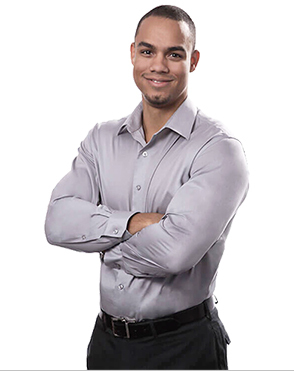 They use Creapure, which is an excellent source of quality creatine. The dose is good for me at 3 grams, which is what I take of regular creatine mono powder to stay saturated. I like taking the Crea-Tech on my rest days, because mixing up creatine powder on those days isn't my favorite. This formula includes a lot of extras, like electrolytes. If you are lacking in those, this may be a good supplement for you. I found it gave me no stomach upset or bloating. It was very easy on the stomach, which I was please to see. The downside is the price. It is pretty expensive, which prices me out a bit. It is a quality product, and I have no problem recommending it if you believe it would suit your needs. I was extremely lucky to win a Blue Star Nutraceuticals promo that included Crea-Tech. This creatine comes in pill / capsule form which is honestly something i prefer. I've tried many different types of creatine, some with flavors too strong for my liking. Others were flavorless which was better however these pills were really easy to use. Also the fact that they come in pill form, means it's very easy to take with you if you travel a lot. So perfect for convenience as well. A pill is a little bit longer than a dime (10 cent coin) in American currency. You swallow it whole but they go down very easily and don't get stuck in your throat like many dry pills out there. It's also flavorless and it's 4 pills per serving. Formula wise, Crea-Tech comes with 3 grams of pure creatine per serving, as well as an electrolyte blend for hydration and more. Their Creatine is definitely high quality. Now to the most important thing: How effective is Crea-Tech? Personally i noticed an increase in my strength over the last 2 weeks since i've been taking it. I feel stronger, my lifts gone up and i feel good physically overall. I definitely am a fan of this product and would use it as my main source of creatine if it wasn't for the price. Normally i never mention prices in my review because most supplements are all priced competitively with each other. Some are a bit more expensive than others but no huge jumps in prices overall. However a tub of Crea-Tech comes down to $49.99 for a 1 month supply. This comes down to $1.67 per serving as opposed to $0.10 - $0.20 per serving of the competition. Of course not all creatine is made equal and i believe Crea-Tech definitely ranks among the best i've tried. So i highly recommend it to anyone looking for a top tier creatine to add to their stack if budget isn't a factor for you. Overall i loved using this product and it has helped me set PR's in the gym as well as increased my muscle size a bit (seeing good progress). 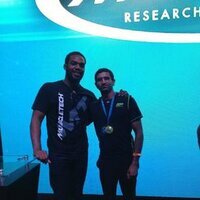 I feel stronger and last longer in the gym without getting fatigued quite as fast as without it. Really a great product that's effective and works. Ps: Perhaps not as interesting to others but i personally loved the design on this product. The way the light reflects back in different colors is very cool. Never seen that in other products before and i think it makes Crea-Tech stand out even more! Ease of use: 10/10 I took my 4 caps before I worked out. Pretty easy to do with one swallow. Effectiveness: 10/10 Pretty impressed here. I've been in a caloric deficit for some time now, but my workouts have been awesome and even getting better since starting to use this. Very impressed. Not an energy boost per say, but I've definitely felt stronger and less run down that I have been Price: 5/10 This is always tough for me. $1.67 per serving. I love blue star, but don't love their prices. To each their own. If you find it "worth it" or cost isn't a huge factor to you, then this is great. It's just hard for me to look past that when creatine monohydrate is like $0.10 a scoop. I know this isn't the same product, but it's similar. Overall-8/10 Only reason I'm dropping it from a perfect score is price. Like I said, to each their own, but price is a big factor for myself personally. Other than that, it's a great product that worked great for me. I'm a big believer in creatine and think everyone should be taking it, female or male. Definitley felt like it kicked in faster than regular creatine monohydrate and provided excellent endurance for quality repetitions. Would advice to take on a full-stomach or pack a banana/snack for the gym since the PH alteration may cause you to feel a bit hungrier than usual; appreciate being able to directly empty the caps into my pre. Highly recommended for a fast-acting creatine source! I was looking for a boost without the buzz of some pre-work products, and I found it in Crea-Tech. Although, it is not a 'pre-work' product per say, it does give you a nice edge for work outs. I found it great for aerobic activity as well. I'll take four caps about 30-45 min before my work out and it's good. 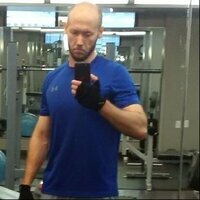 I work out for 3-3.5 hours per session. I recommend that with a BCAA's drink and maybe a banana depending on how hard you work. I wanted to like this product as the write up and promo info is so impressive. Honestly, it just didn't live up to the hype. As a brand, I've been pretty unimpressed with all the Blue Star products that I've tried--especially considering the price point of their various supplements. Allergy Warning: Processed in a facility that processes milk, egg, soy, peanut, tree nut, fish, and shellfish ingredients. Directions For Crea-Tech: Take 4 capsules of CREA-TECH™ once a day. Warnings: KEEP OUT OF REACH FROM CHILDREN. DO NOT USE IF PREGNANT OR NURSING. NOT INTENDED FOR USE BY PERSONS UNDER 18. Consult a health care provider before use if you have been treated for, diagnosed with, or have family history of any medical conditions, or if you are using any prescription, or over-the-counter, medications. Consult a health care provider before starting any diet or exercise program. Do not exceed recommended servings. Improper use of this product will not improve results and is not advised. Use only as directed. Do not use if safety seal on this package has been broken. Store in a cool, dry place (60°F to 80°F).